Producing a high yield, this machine is sturdy and durable, having proven itself over decades on board trawlers and in land factories. The high capacity as well as easy operation and maintenance, safe functioning and wear resistance make for the most famous filleting machine available. The drive and operation is not complicated – making it an economical purchase. Fillets are produced with a smooth clean cut due to the careful handling of the raw material. Mechanized filleting also ensures improved hygiene and safety. This modified machine is capable of processing headed and gutted (h&g) small sized Hake to single fillets with a maximum throughput of 36 fish/min. 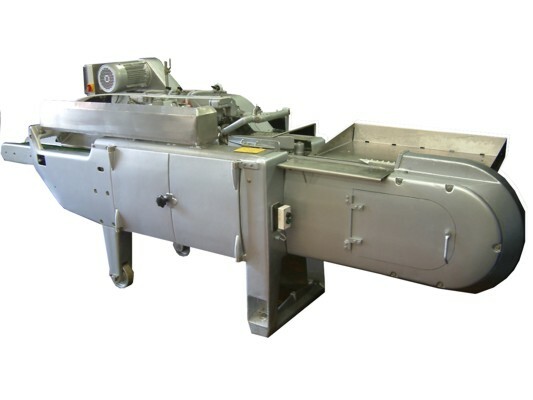 This processing machinery can cut a size range of about 120 grams to 270 grams, fish length 180mm – 280mm. Our unique modification has increased the yield significantly higher than normally achievable with processing small hake using standard 188’s.